Check which Budget Liveaboard options are available in Palau! Compare the Luxury Liveaboards of Palau! The country’s rock islands offer a variety of exciting dives: WWII wrecks, Shark-infested channels, blue holes, a freshwater lake with stingless jellyfish and even a small number of caves. There are also steep walls covered in lush spongy corals and massive anemones. 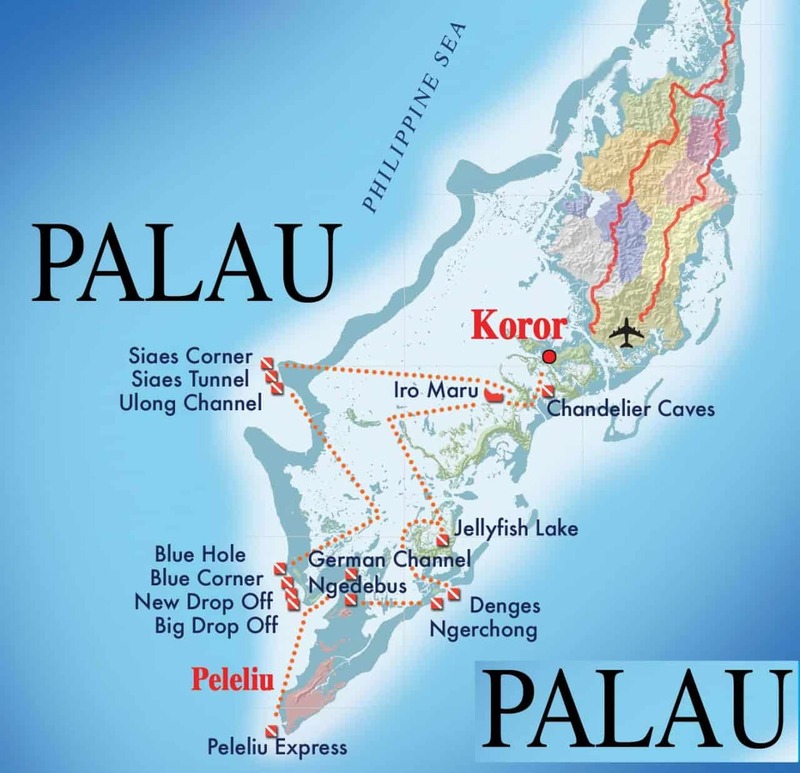 Beginner divers may find Palau’s strong currents challenging. All these dive sites are best explored by Liveaboard. Palau has three ocean currents meeting together in its waters to bring in some of the most varied and dazzling marine life in the world. Palau Island is also blessed with a rich assortment of plants & birdlife. Soft sand beaches, tropical rainforest, spectacular waterfalls and hidden lakes offer a splendid backdrop to Palau’s fascinating geological formations, significant archaeological sites and world renowned underwater wonders. I usually use this website to book in advance my liveaboards in Palau as they usually have the lowest rates I find. I like it because they have an easy booking system. 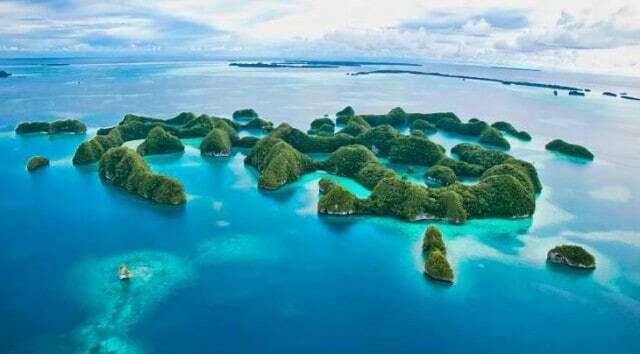 The Republic of Palau is Micronesia’s western most archipelago in the Caroline Islands chain. The tightly clustered Palau archipelago, consists of eight principal islands and more than 250 smaller ones covering an area of 459 square kilometers. 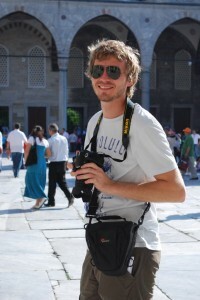 Best time to go on a liveaboard in Palau? Palau Island enjoys a pleasantly warm climate all year round with an annual average temperature of 27 degrees Celsius (82 F). Rainfall can occur throughout the year with an yearly average of 150 inches. The average relative humidity is approx 82% and although rain falls are more frequent between July and October, there is still plenty of sunshine. Water temperature varies little throughout with the year, with a pleasantly comfortable average temperature of 27 degrees Celsius (82F). While Palau diving is great all year round, the best diving season is considered to be between late November and early June because it’s considered to be the “dry season”. The “wet season” has higher humidity and rainfall, where July and October being the wettest months. The annual highlights include the Manta mating season in Yap in December, Grey Reef sharks mating season in Palau from February to April, Coral spawning in Palau in May and Grouper spawning in July. 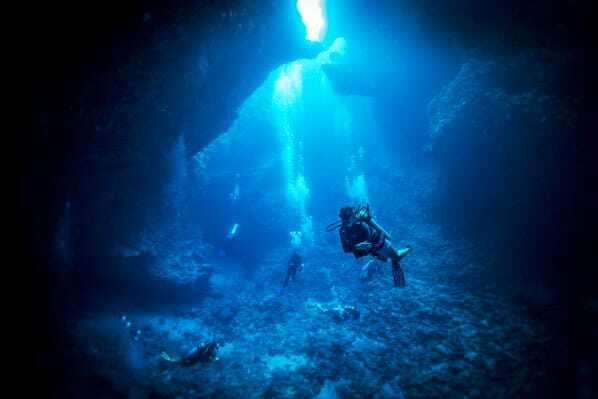 Scuba Diving in Palau The Ngemelis Drop-Off is considered to be one of the world’s best wall dives. Starting in water just knee deep, the wall drops off vertically nearly 300 meters. Divers can free float past a brilliant rainbow of sponges and soft corals whose intense blues, reds, or pure whites form a back drop for quivering nine foot orange and yellow sea fans and giant black coral trees. Blue Corner is regarded as one of the best single dives on Earth! The wall is vertical and deep and is known for it’s sheer abundance of underwater life. There are large pelagic fish; schooling barracudas; tropical fish in every variety; turtles; guaranteed sharks; hard corals; soft corals; and fan corals. Strong tidal currents nourish this chain of life. Best diving is from 15 to 24 meters. Not a dive for beginner Scuba divers. Blue Holes is a huge cavern on the north side of Ngemelis Island. Four big holes on the ceiling enable a lot of ambient light to penetrate the cave and create great photo opportunities. Maximum depth is 30 meters. Big Drop Off, just what the name implies is “really big”. About 30 feet from the mooring buoy to the east at 35 feet (12 meters) a large chain connected to a 6 foot (2 meter) steel sphere can be seen. This chain and ball was used during WWII to prevent the Japanese from entering the waterway leading to German Channel (see below). Lieutenant Barnum from the US Navy conducted the Operation. The chain and ball on Big Drop Off was a mystery for 40 years until newly appointed Admiral Barnum returned to Palau in 1986 and told his story. Today, many Manta Rays visit the channel and feed on the plankton that the strong currents bring. Few cleaning stations in the channel’s mouth allow one to view those great creatures from a short distance. The cleaning station is at 18m and the beautiful Coral garden at 7-13m. From Koror, the Liveaboard diving itinerary normally includes the following diving sites: Iro Maru, JellyFish Laki, German Channel, Denges, Ngerchong, Ngedebus, Peleliu Islands, Ulong Channel, Siaes Corner, Siaes Tunnel. The order in which dives are done depends upon the currents and weather conditions. Speedy drifts along the reefs with schools of snappers and trevally are expected at dive sites such as Ulong Channel and Siaes Corner. Divers can enjoy the spectacle of seeing spawning bumphead parrotfish and grey reef sharks as well. German Channel is the place for Manta ray action at the cleaning stations. As Scuba divers rest on the bottom, they can watch the display or swim in the shallows as the Mantas approach. At Peleliu Island schools of snapper congregate to spawn near “the Cut” meanwhile lucky divers may meet bull sharks, silver tips and black tip reef sharks. Furthermore, there is also opportunity to visit the furthermost island dive sites to the north at Badeldaob Island.